Three weeks down, only forty-nine more to go! FOX’s newest reality series Utopia just wrapped up its seventh episode and we have yet another newcomer to the cast. It’s hard to believe that we have already had two people to “self-evict.” (Pardon the Big Brother lingo… I don’t know what you would call that on Utopia.) This time, we have Ernesto joining the cast. He is the replacement for Pastor Jonathan, who had to leave due to the need for surgery on his broken thumb. 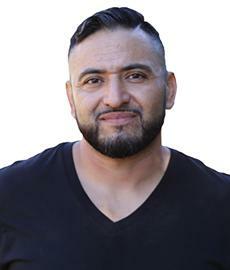 ERNESTO is a 39-year-old widowed contractor who comes to us from Oceanside, California. According to his bio on the Utopia website (which you can visit here), his skillset includes plumbing, heating and A/C, building, hunting and cooking. Talk about a jack-of-all-trades. He is also most likely to “overthrow Aaron as the food czar.” YES! I can’t stand Aaron! If Ernesto manages to overthrow Aaron at all, I will be jumping for joy. Ernesto’s utopia is “dictator-free and bloomin’ with potential love.” Expressed in emojis, Ernesto’s would include the peace sign, worship hands, and the sparkling heart. He’s one of those peaceful “I love you man” types. I’m currently taking bets on how long it’s gonna take him to lose his temper and go off on someone… hopefully Aaron. OK, now that we have the obligatory introduction out of the way, on to the main event: this week’s power rankings! BELLA: Right off the bat, Bella is losing points for bringing up the fact that the women need pads for their periods. GROSS GROSS GROSS. *covers ears* (-10 points) I know its something all women go through but dammit I was eating when she brought this up and I suddenly lost my appetite. Thanks. Anyway, I’m going to be nice and give her some points right back because she told Aaron to “kiss mah grits!” (+25 points) Major eye roll as she has her regular meltdown, this time because her precious, beloved water filter was returned to sender. The way Bella acts, you would think someone close to her died or something. She is so over-the-top emotional! CHRIS: Ok, what has this guy done this week? Except for be involved with Bri? If he doesn’t stop that, I will start deducting points. This week he doesn’t get rated .He hasn’t contributed anything. DEDEKER: I don’t really have anything against Dedeker at all. She seems nice enough. But she really didn’t make much of an appearance in the two episodes this week. It’s rather hard to rate someone when there isn’t much to base it on. 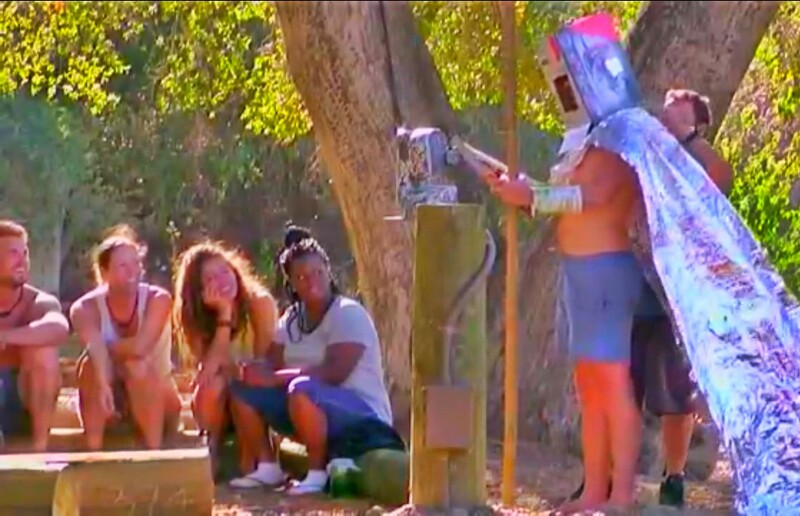 ERNESTO: The newest guy to Utopia, Ernesto, has already started off on a positive note. He helped install Bella’s precious, beloved water filter and now everyone has fresh, clean water to drink. Even more importantly, Bella can finally STFU about her stupid water filter! On behalf of everyone in America, we thank you Ernesto. That’s one less thing she has to whine about. (+20 points) As Kristen and Hex were asking questions of the men in preparation for the auction of the men of Utopia, Hex asked Ernesto what his hobbies are. His response? “Laying pipe.” LOL! This guy is funny as hell! (+15 points) I expect Ernesto will continue to be a good fit with the group. He has a sense of humor, a strong work ethic, and a desire to get along harmoniously with others. NIKKI: Go, Nikki for suggesting “The Utopia Experience” as a way to bring income to the group, as opposed to just yoga or Aaron’s stupid boot camp. (+10 points). That being said, Nikki is still rather boring to me. MAJOR LOL MOMENT HERE: Bella was out and about watering her crop circle garden, when she asked Taylor to help her with the hose. Ummm… why? Is it that hard to control the hose, Bella? Methinks she just wants to help Taylor with his hose. Anyway, moving on. Taylor doesn’t really want to help Bella with the hose. She continues be beg, plead and beseech him for help. He snaps back with “It’s a hose, Bella! My mom could do that! Quit being lazy. It’s a hose, and you’re being lazy.” (+45 points) I lost it. Taylor totally knows that she didn’t really need help with that hose. She’s just thirsty. There you have it. Another week of power rankings done. What did you think? Did your favorite do well in the rankings? Comment below and let me know what your thoughts are!